To describe Cyprus as a divided island is to state the obvious: the ‘green line’ divides Turkish Cypriots in the north from their Greek Cypriot neighbours in the south, and a passport is required to cross from one to the other. But this stunningly beautiful island, home to Aphrodite and Apollo, is divided in many other ways. The resorts of the south coast, home to Marks & Spencer, Debenhams and hordes of British tourists, are a far cry from the peaceful interior. Dotted with humble villages, herds of meandering goats and iconic orthodox churches, the hills were strewn with wild herbs and carpeted with flowers on my Spring visit. Wine is also an industry – and indeed a philosophy – that is sharply divided on Cyprus. Just a decade ago 95% of production was in the hands of four enormous companies (per capita, Cyprus is one of the biggest wine producers on the planet). The companies – Keo, Etko, Loel and SODAP – still exist and produce enormous amounts of wine, but they have been joined by around 50 boutique wineries, based high in the hills amongst the vineyards, and not in semi-industrial zones close to the coast. The division here is stark. Membership of the EU in 2005 heralded a new age for this ancient island, and the revolution in the wine industry since has been fast and far-reaching. The big four have reacted, building winery facilities in amongst the vineyards and concentrating on improving quality, so the wine scene on Cyprus is fast-moving and of interest for wine lovers looking for something just a little bit different. As can be seen from the maps to the right, Cyprus has a geographical position that is as much Middle Eastern as it is European. Lying further east than Libya and Egypt, the culture – including food – fuses Greek, Turkish and Middle Eastern traditions. humus, feta, moussaka and souvlaki are present and correct, but the exotic tang of coriander and cumin runs through many dishes. The shaded areas on the map of Cyprus’s show the wine producing regions clustered around the Troodos mountains, which climb from the coast to the peak of Mount Olympus at almost 2,000 metres. These mountains are the linchpin to the modern breed of fine wine estates. Up here are some of Europe’s highest vineyards, where the lower temperatures and high levels of UV light are capable of producing grapes of high quality. At Kypranous vineyards way up at 1500 metres, I struggled to keep my balance in the wind. Up here, the recorded temperature has exceeded 30c on only two days in the past two years, whilst on the coast, heatwaves of 45c are not uncommon. Drought was so bad in 2008 that tankers of fresh water plied back and forward from mainland Greece. So far, Cyprus remains Phyloxerra-free and ancient bush vines thrive on their own roots. Cyprus has 5,000 years of vine-growing tradition, but the bulk of the island’s vineyards are still given over to the indigenous Mavro, the ‘black’ grape. Mavro is a fairly undistinguished variety, but was the bedrock of ‘Cyprus Sherry’ and the island’s bulk wine production. Xinisteri (or Xynisteri), is the main white grape, and though again used historically in bulk production, it is also the base of the best Commanderia sweet wines, and, when grown at altitude particularly, some truly interesting dry whites. Another ancient, indigenous grape to note is Maratheftiko, which is seeing a great revival amongst the island’s most quality-conscious producers for its decisive, cherry and herbal flavours. There has been much planting of international varieties too, with Cabernet Sauvignon, Grenache and Carignan to the fore, but it is Syrah that seems to be moving into centre stage amongst the most progressive boutique producers. My visit concentrated on some of the island’s small, high-quality estate producers, though I did check out what two of the giant, the SODAP and Etko operations, were doing too. Profiles of the estates follow. Relatively few of these wineries have UK distribution as yet, but keep your eyes peeled and palates at the ready: there’s some truly fascinating stuff beginning to emerge from the mountains of Cyprus. 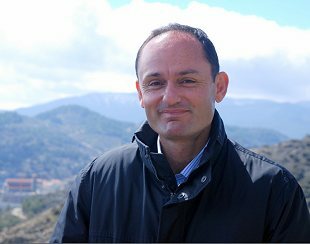 Marcos believes that the conditions in Cyprus are much closer to the New World than Europe, and their modest 17,000-bottle total production is aimed at the top of the Cypriot market, as they push the envelope on price, asking 20 Euros retail for their wines. “Ten Euros or so is the upper limit for most locals for domestic wines, even though they will spend 100 on imported wines quite happily,” says Akis with a shrug. UK Master of Wine and flying winemaker Angela Muir (inset, right) is consultant here, and was at the winery to greet me. Olympus is part of the giant Etko, one of the island’s four larger operations, but one which is shifting from a history as a bulk producer of Cyprus Sherry and other sweet wines. 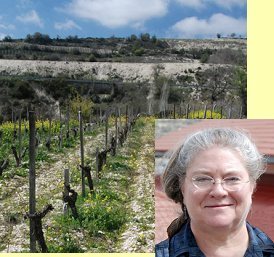 For past few years they have been retracting, to create a more boutique winery up amongst the vineyards at Omodos, rather than trucking grapes to its old facility in Limassol – “Nowadays almost no grapes go there,” says Angela. She also says she would like to move various varietals higher up the mountain: “Especially early ripening varieties like Merlot that develop a lot of alcohol and big tannins. Altitude is the key here.” Everything we tasted at the winery was very recently bottled during Angela’s visit, so it possibly was not showing at its best. Sophocles was the first to introduce ageing in oak barrels to the village wineries of Cyprus, and today makes wines from Syrah, as well as Cabernet Sauvignon, Cabernet Franc and Merlot. He has also experimented with Cypriot variety Maratheftiko, but his focus seems to be on making the best wines he can from within his cramped but manageable facility, whilst consulting for other wineries as part of a concerted effort to put the wines of Cyprus on the world stage. Certainly his efforts are amongst the islands most impressive to date. 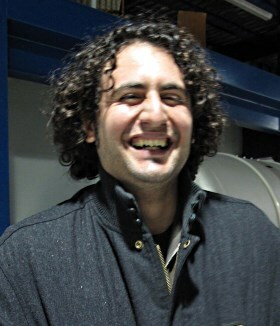 Sophocles Vlasides is also oenologist at this estate which is best known for its Sauvignon Blanc – it makes 70% of the island’s entire production. The vines in the terraces pictured right are alive, but only just after the drought of 2008 (their first year of planting) almost killed them. “But there are still green shoots,” says owner Costas Tsiakkas (inset). 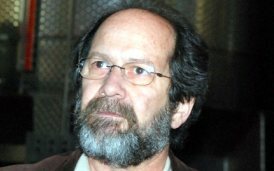 Costas founded the winery in 1988 when he was just 21 years old. 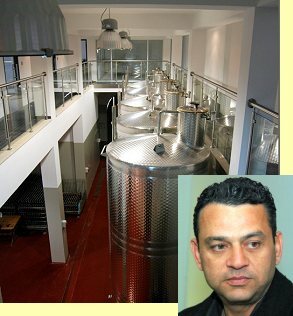 Having obtained an MBA in California, he returned to Cyprus with the idea of starting a quality winery. He tells me he originally planted Riesling, “But I travelled to Alsace and decided at that point to give up. Yes, I could make a good wine from Riesling, but I cannot make expressive Riesling like that.” His vineyards range from 600 to 1300 metres altitude. Kamanterena is the Paphos winery of SODAP, one of the ‘big four’ wineries on Cyprus. Winemaker is Alexis Machuca (right), originally from Venezuela, who oversees a production close to one million bottles. Kamanterena is essentially a co-operative of 10,000 grower members, but centrally employed oenologists work closely with growers and incentivise them to produce better quality in return for better prices for their grapes. Employing Australian consultants has been one factor that has led to wholesale changes at Kamanterena. Alexis is particularly proud of their ‘Ganimede’ tank system. Essentially two tanks stacked one on top of the other, Ganimede exploits the large amount of carbon dioxide – 40 to 50 litres of gas per litre of must – produced by the fermentation process. The tanks use escaping Co2 for ‘pumping over’ without using any electrical or other energy source. Alexis says it allows them to make all different types of fermentation: “some which emphasise tannins, some that makes softer wines – you can do exactly what you want.” Ganimede is part of a seven million Euro investment that was made in 2004. We tasted extensively from tank, with Xynisteri, Semillon and Ugni Blanc fresh, simple and fruity. Chardonnay sees some barrel and was well balanced with a nice texture, and Merlot and Syrah had good fruit and savoury structure. Cabernet was quite grippy and tannic, whilst Maratheftiko was solid and meaty. Kamanterena’s ‘Island Vines’ range is available in Waitrose stores. Ezousa was established in 2003, in the wine village of Kannaviou in the mountains above Paphos, by Michalis Constantinides (right). 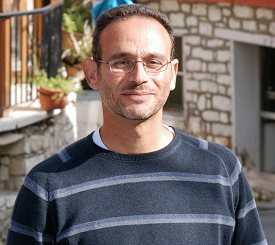 A qualified chemical engineer, Michalis gave up a promising career to follow a family tradition of grape growing. But he is typical of the young generation who are not happy simply to sell to the cooperative, but to establish their own wine estate. He produces around 50,000 bottles annually from 15 hectares of his own vineyards and from local growers, where Michalis monitors all aspects of viticulture through the growing season and harvest. He says his soils are rich in chalk and iron, though those close to the forest have more clay content. Vineyard altitude runs from 500 to 1,000 metres. He uses both international and indigenous grapes, though says he is abandoning Mavro, having used it in blends until the 2006 vintage. The small winery at the entrance to the village welcomes visitors for tastings. 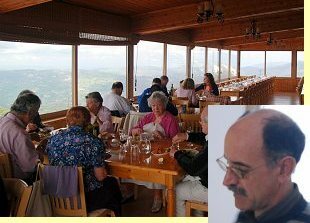 Kolios is one of the most established of the new breed of estate wineries, and one of the most popular especially for its excellent restaurant with sweeping panoramic views over the Troodos Mountains above Paphos. 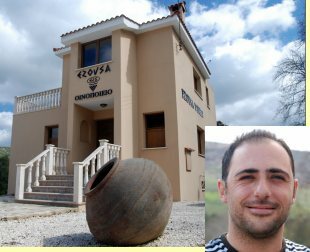 Marios Kolios says he has structured his winemaking venture near the village of Statos Agios Fotios on three basic principles: wines of a very high quality; prices that are very reasonable; a totally user friendly winery where visitors are actively encouraged. This is a sizeable operation producing 350,000 bottles as well as 100,000 litres of ‘bag in box’ wine, with vineyards planted from 900 to 1000 metres altitude. His Xinisteri, from vineyards on a bedrock that is 98% limestone, is one of the best on the island. The altitude and limestone allows him not to irrigate – all of his vineyards are dry farmed – which he believes accounts for better aromatics in Xinisteri. He uses only natural, ambient yeasts in vinification and a regime involving minimal sulphur. Perhaps the most charming winery on Cyprus is Vasa, a family-owned estate in the village of Vasa Koilaniou, on the slopes of the Troodos mountains about 25km from Limassol. 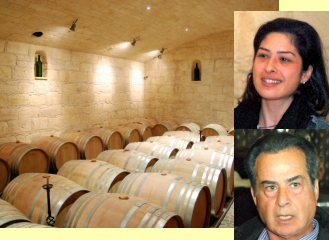 Pambos Argyrides and his daughter Rebecca have restored and extended an absolutely beautiful, 200-year-old winery over the past 10 years, with phenomenal attention to detail and astonishing craftsmanship in the stone and woodwork of the building. Turning every corner has another delightful carving or stone detail. Their vineyards, whose altitudes range from 850 to 1000 metres, grow Mataro, Cabernet Sauvignon, Chardonnay and Merlot, as well as Maratheftiko. Currently the produce 18,000 bottles, but have capacity for 80,000. Having made his money living for 15 years in South Africa, Pambos says his plan is to stop production at around 40,000 bottles as more vineyards come on stream. Only estate fruit is used here. The market for Vasa’s wines is in the quality restaurants and wine merchants of Cyprus, exporting only a small quantity to Switzerland currently. There is a sense of a man searching for perfection here, and the wines – already very good indeed – are worth watching. The immaculate winery (which is open to visitors) is truly state of the art, with sorting tables for grape reception, and operating entirely by gravity flow. He uses mostly American oak, but as he learns says he will use different oaks and proportions of barrel for different markets.